Of the 500+ reviews on this blog, the vast majority have been Trader Joe's brand foods or beverages fit for human consumption. However, there have been one or two that we've deemed "not fit for human consumption." There have been one or two that haven't actually been Trader Joe's brand. There's been food fit for animals—and of course animal food fit for humans. We've entirely avoided reviewing Trader Joe's fine line of household cleaners, flowers, hygiene and beauty products. Yes, you can find all of those things at TJ's, and the few that we've tried we've been fairly impressed with. But now this product is walking that fine line between "beverage" and "medicine." And while one might argue that TJ's beers and wines can be used for "self-medicating" purposes, this is fairly new territory for us. So really, we're not going to be able to tell you much about the immune system-bolstering properties of this product. Although I'm perfectly willing to eat out of a dog bowl, I'm not willing to subject myself to a scientific scenario that would expose me to real cold germs. I must say, though, that I often get sick this time of year. I've noticed a lot of people get sick this time of year actually. There seems to be a round of colds whenever the weather changes, even if it's getting warmer instead of cooler. I'm not going to research that claim at all for fear that I will find information that contradicts my hypothesis. But Sonia agrees that people get sick just as the spring arrives, and that's good enough for me. Despite that fact, neither of us has gotten sick this year. Could that be evidence that this product actually works to strengthen your body's natural defenses? I say...maybe. 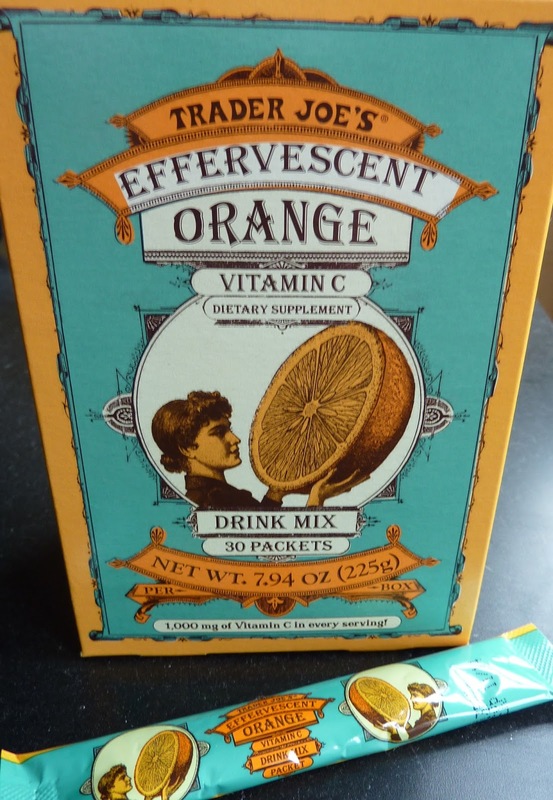 So anyway, as you've probably already figured out, this product is a store-brand version of Emergen-C. We've always been fans of Emergen-C, and we usually have some on hand here in our household. Not only do we like its nutritional properties, but we love the taste as well. Sonia got in the habit of mixing herself a glass to have with dinner if we ever ran out of juice and iced tea, since it's sweet and tastes good enough to drink just for the flavor. That's our biggest complaint about TJ's version. It simply doesn't taste that good. It's not bad...but it's less sweet and orangey than the name brand product that we're used to. It's less pungent—less flavorful all around. 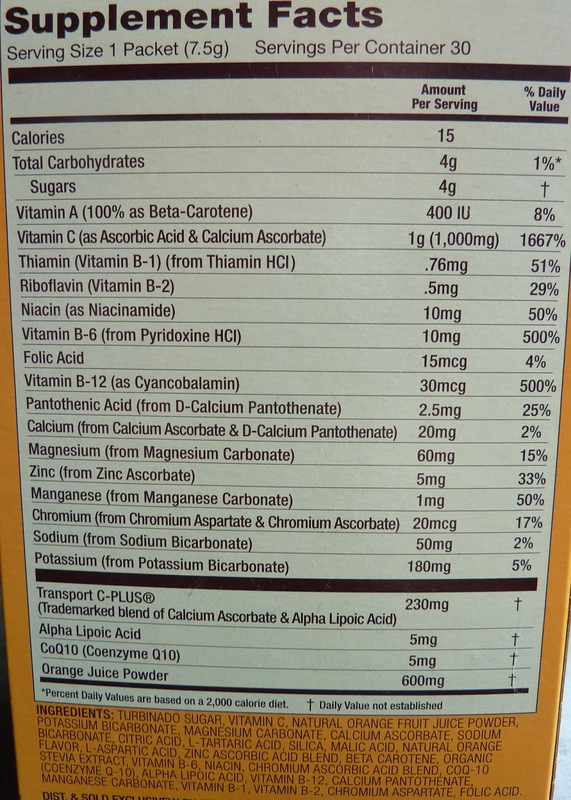 The nutrition information is similar to Emergen-C, and includes 1667% RDA of your vitamin C and 500% of vitamins B-6 and B-12. Both products give me a little energy rush when I drink them, particularly when I'm not sick. TJ's version is a little less expensive than Emergen-C at $7.99 for a box of 30 packets. Overall, it's a decent product, but we think we'll stick to Emergen-C for now since it tastes significantly better. 3 stars from Sonia, 3.5 stars from me. 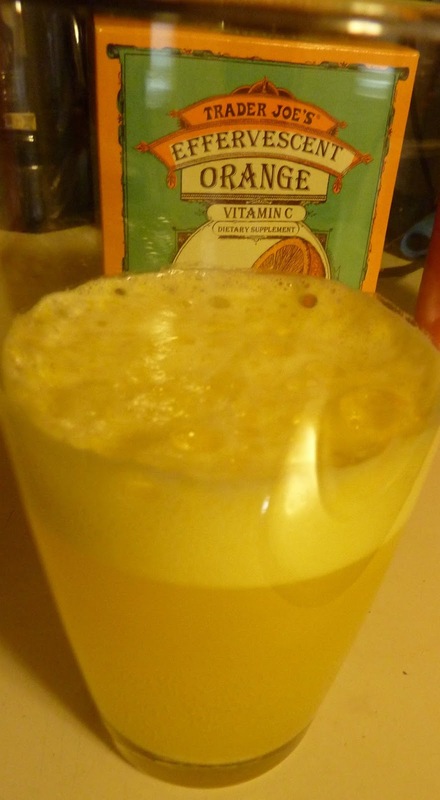 I drink Emergen-C mixed with Sunny D. Maybe try it with OJ for a better flavor. I'm sick right now, so maybe I should try it. But of course I don't feel like going out to get it. This always happens. hope you feel better soon, halcyon!